Happy Valentine's Day, lovely people! 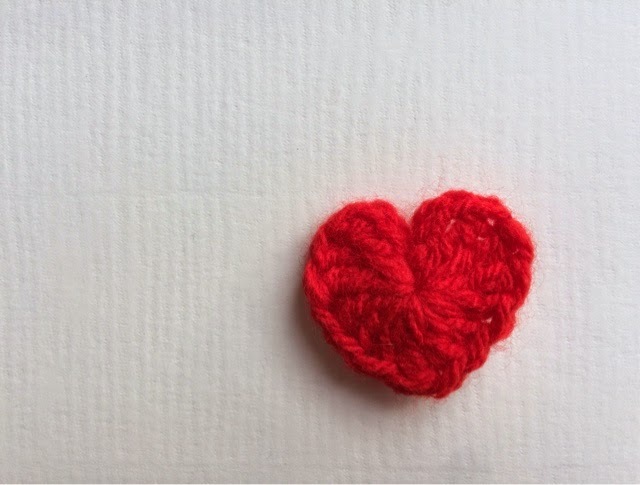 My current love is these gorgeous crochet hearts. I determined to work out how to make them and now that I have, I can honestly say that they are SO easy!! One of my friends teases me whenever I say this, but, believe me, it really is easy - once you know how!!! I found a great video tutorial that I watched several times before realising she was talking American-crochet-speak. Once I'd wired out the UK equivalent, there was no stopping me! 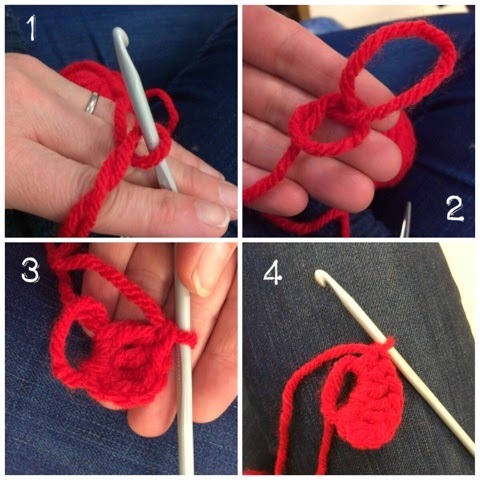 Pull the end tight to close the ring and form the heart, then tie off. See, I told you it was easy!! These photos aren't the best but they show 1) & 2) making the magic ring 3) having chained 3 and double trebled 3 and 4) half a heart. The size of your heart will depend on the type of wool used and also the size of your crochet hook, but rest assured, anything goes. You'll soon have a little pile of gorgeous crochet hearts to play with! I crocheted a long chain and attached the bigger hearts to make some lovely bunting (photo evidence to be added later, sorry!). I added brooch backs to the little ones for Valentine's gifts. Crochet-love is a real thing in our house. I'll tell you more next time! Much love for a happy Valentine's Day.